The year is 1938, the ship is leaving from Salvador, Bahia and planning to dock in Denmark where it is supposed to deliver a load. Something happens along the way and the ship fails to complete the journey. It sinks near the Brazilian coast. Fast forward to 2006, a scuba diver happens upon a shipwrecked boat full of logs. In a slow process— log by log— the remaining wood is removed from the ocean and released back into the world. The logs are intact— preserved by mother nature: the ocean. This is the first guitar I have made that pays homage to this historical event. At the turn of the century, Denmark was the country that purchased most of Brazilian rosewood logs for furniture building. The same mid-century modern furniture that is still idolized today, is made from this wood. From the shipwreck I have salvaged super quartered curly and colourful Brazilian wood. 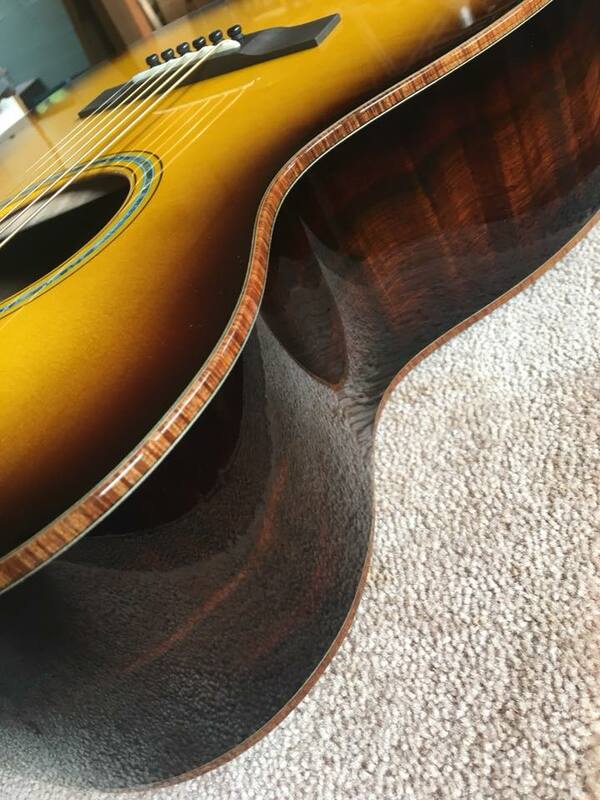 This guitar is paired with the highest quality Sitka top, super curly koa binding and the best one piece mahogany neck and finished off with a complete subtle tobacco sunburst.